We want to increase the number of cows on the Balinese island of Nusa Penida, the home of our Bali Bird Sanctuary. Helligdommen, den eneste af sin slags i Indonesien, provides a haven from poachers and wildlife traders where we rehabilitate and release ex-captive endemic birds, including the Bali starling, one of the world’s most endangered birds. I de sidste par år har vi brugt Bali køer til at producere høj kvalitet gødning til kompost, som igen bruges til at fodre frøplanter i vores genplantning planteskole. Disse frøplanter en dag vil blive plantet for at genskabe nogle af Nusa Penida skove, og disse træer i sidste ende vil sørge for mad og husly til øens fugle. A donation of Rp 1,500,000 (approximately US$150) will buy half a cow. You can of course buy an entire cow instead. Anyone keen to make a contribution to this project can call Kirana on 0361 9777978 or email kiranagustina@gmail.com. If you can help us you will receive a special picture of your cow. You can also donate via our website. An added bonus with this project is that the cows also bred and their calves can be sold to provide extra income to FNPF, to support our conservation projects on the Nusa Penida, and also to the farmers who have helped us raise them. We recently sold our first calf for Rp 4 million (US$400), with half the proceeds going to the farmer. 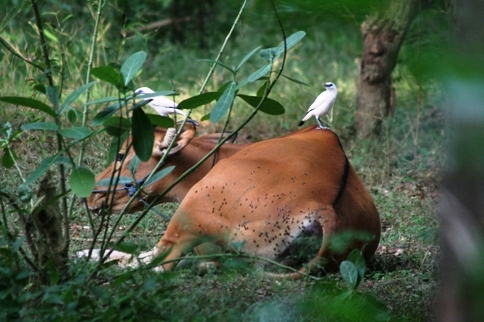 Please help us boost the cow population on Nusa Penida, which will help Indonesia’s native wildlife – including the Bali starling and Java sparrow – to flourish and survive. Indonesien har verdens næsthøjeste antal truede fugle.